The photographer credited for each photo is as follows. Note that unless otherwise specified, the photographs are from the McIntyre-Culy private collection. Click the name of the photographer to see more information from a previous episode about that woman. You’re listening to Photographs, Pistols, and Parasols. Support for this project is provided by listeners like you. Visit my website at p3photographers.net for ideas on how you, too, can become a supporter of the project. In today’s episode I’ll reveal who the photographers were in the works that I featured in the my marvelous montage that I put together to celebrate international women’s day on March 8th, 2019. For more information about any of the women discussed in today’s episode, visit my website at p3photographers.net. That’s letter “p”, number “3”, photographers “dot” net. Today I want to talk about the montage that I put together and posted over on the Facebook page back on March 8, 2019. The montage was to celebrate early women photographers everywhere for International Women’s Day. What I didn’t put in the post on Facebook, though, was who the photographers actually were behind the 11 photographs that you can see in the montage. So today I want to talk about that. I’m going to post the montage again on the episode notes for today’s episode. You’ll find that, of course, at p3photographers.net. Now, when we look at the image, it’s got 3 rows of photographs, and I’m going to talk about them starting with the top left, and going left to right, row by row. So in the top left, we have an image of The Manger, the photograph that was done Gertrude Käsebier back in 1899. That was, of course, the beautiful pictorialist image that she did that she sold for the then unheard of price of $100. That photograph is taken from the library of Congress archive. Moving across the top we find a beautiful picture of ferns taken by Margaret DeMotte Brown. One of the many different kinds of photography she did was doing work for the Botany Department at Vassar College. She did a series of works that were eventually published in a book, and the Vassar College archive actually has a collection of those images, and that’s where I got this beautiful picture of the ferns. Now, the next picture over is taken by Frances Benjamin Johnston and shows President McKinley on his way to the Pan-American Exposition in Buffalo, New York, on September 6, 1901. That photograph is taken from the Library of Congress archive; I’ll talk a little bit more about that at the end, after we get through the rest of the images. The last image in the montage in the top row is a picture of a really cute little girl with a pretty dress with a lacy collar. That was taken by Mrs Rosa Vreeland Whitlock in McPherson, Kansas. Rosa Vreeland ran a studio for many years in McPherson, Kansas. While she was married to Ogden Whitlock her professional name was Mrs Vreeland Whitlock. That marriage, and that studio branding, lasted only from 1890-1984, so we know that this image must have been produced during that time period. Going down the montage, we see in the middle row a picture taken in 1924 of a wedding party in Caldwell, Idaho. That was taken in stock a studio run by Margaret and Mary Snodgrass. 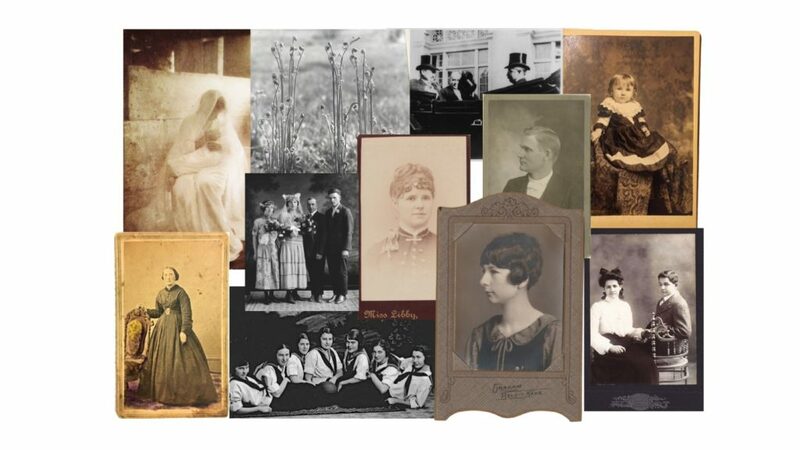 The next image moving across the middle row is a head and shoulders portrait of a young woman taken by Miss Minnie Libby in Norway, Maine. This photo is a small carte de visite, which was popular in the mid to late 19th century. That suggests that this photo was taken early in Minnie Libby’s 60+ year career, as she opened her studio in 1885. Moving to the right we see a profile portrait of a young man who is actually seated; in the entire image you can only see him from the waist up. This beautiful image was taken by the Misses O’Donnell studio in Beloit Kansas. That’s “misses” O’Donnell: they were the sisters Margaret and Anna O’Donnell. Although there’s no date on this photo, the O’Donnell sisters ran their studio in Beloit, Kansas in the early part of the 20th century. Moving down to the bottom row of the image, we see first a woman standing with her hand on the chair. This CDV was taken in the middle of the 19th century, but it is slightly colorized when you look closely at it. That was taken by Mrs Lydia Hicks in Brooklyn, New York. Moving to the right we see a picture from 1922 of the College of Idaho girls’ basketball team. They are seated on the floor, arranged artistically. That was taken in the Snodgrass studio in Caldwell, Idaho. The studio was run by Mary and Margaret Snodgrass. The next picture over it is a beautiful profile of a young woman in a really fancy frame. Now that picture was taken sometime in the early 20th by the Graham studio in Beloit, Kansas. The Graham studio was run by Ella and Sarah Graham, two sisters there in Beloit, Kansas. The final picture in the lower right-hand corner of montage is a young man and a young woman in a curved double chair that is really kind of intriguing. That was taken somewhere between 1899 – 1904 by the Duclos studio in Lowell, Massachusetts, and we know the approximate date because the Duclos studio only operated out of the location that’s on that photograph between 1899 – 1904. The Duclos studio at that point was run by the brother and sister Serge and Gustav Duclos. Later, Serge Duclos, the sister, would go on to run her own studio under other names. Now, as you may have recognized, I have already talked about many of these women here on the podcast. Now, for two photographs I haven’t actually discussed the photographers behind them. For example, I haven’t discussed the lives and careers of the Graham sisters, Ella and Sarah. They were operating [their studio] in Beloit, Kansas around the same time as Margaret and Anna O’Donnell in the early twentieth century. I’ll be doing an episode about them to talk about their lives and careers and also their interactions with the other women running studios in the Beloit, Kansas in the early 20th century. And also I haven’t yet discussed the extraordinary career of Frances Benjamin Johnston, and she will absolutely feature in her own episode coming up soon here on the podcast. I’ll put a link in the episode notes to information at the Library of Congress. They have her archive at the Library of Congress, and they have some really good information on their website about Frances Benjamin Johnston. I really want to feature her because she was such an extraordinary woman and photographer who really was able to reinvent herself to make money from photography in a number of different ways. One of the things that she did was really invent the idea of White House photographer and cast herself in that role for several different presidencies, starting in the late 19th century. She already had a working relationship as the White House photographer with President McKinley by the time they wound up there in Buffalo, New York, when she took that picture. That was taken on September 6th 1901. Now, on September 5th, 1901, President McKinley had actually given a big speech at the Pan-American Exposition, and Frances Benjamin Johnson had gotten a number of great shots of President McKinley, and so she was really happy with the images that she already taken. So, on September 6th, 1901, she sees him to the carriage and takes a picture of him as he setting off for another day at the Exposition. He’s about to give another speech, but as I said, she was really happy with all the images she had taken on September 5th of him, so she didn’t feel the need to go and take more of him giving yet another speech. So, as I said, she sees him off, and in this image we can see him in the carriage, tipping his hat kind of playfully toward her, acknowledging her, and you can tell that they had a warm relationship and a very good working relationship as well. Now unfortunately, after carriage arrived at the Pan-American Exposition that day, after he got out of the carriage and started to go up the steps into the building, he was shot down by an assassin. He died several days later from his wounds. This image that’s in this montage is actually considered the last official picture of President William McKinley before he died. So not only does this photo show technical expertise and also Frances Benjamin Johnson’s skill at inventing roles for herself as a photographer and executing them brilliantly, it also is a very historically significant image that was taken by an early woman photographer. As I said you’ll be able to see the photo montage I did in the episode notes for today’s episode at p3photographers.net. This was of course something that was already featured on International Women’s Day on March 8th over at the Facebook page for Photographs, Pistols & Parasols, and that’s at facebook.com/p3photographers. I do post information about the podcast as well as other information about interesting other pioneering women in professions beyond photography over at that Facebook page, which once again is facebook.com/p3photographers. And remember, you can always reach me by sending email to podcast “at” p3photographers “dot” net. As I said there will be upcoming episodes to explain the women that you haven’t met yet: the Graham sisters and Frances Benjamin Johnson. But in the meantime, I hope you enjoy viewing this montage. It really is just a very small sample of the output by the early women artists and photographers that I feature here in this project. Until next time, I’m Lee, and this is Photographs, Pistols & Parasols.